Own a lodge, hotel, or B&B? Need to revamp or design your website? Here is the best package for your company, to revitalize your website, or get that website designed that you know your business needs. You now have the advantage of getting your Accomodation Website designed with a fully responsive website design. We specialize in designing accommodation websites that succeed. We realize that every accommodation business website needs certain aspects to promote their business, and we have included all the aspects in our Accommodation Package. The Accommodation Component includes a gallery, booking form, services page, and even a specials page, everything that you need to promote, and manage your B&B, lodge or hotel. Responsive Content Management System (C.M.S.) - Putting YOU in control. Gallery - You can have different categories, all displaying images of your accommodation business. Rotational Slide Show - Displayed on your home page, great for promotions or showcasing services etc. 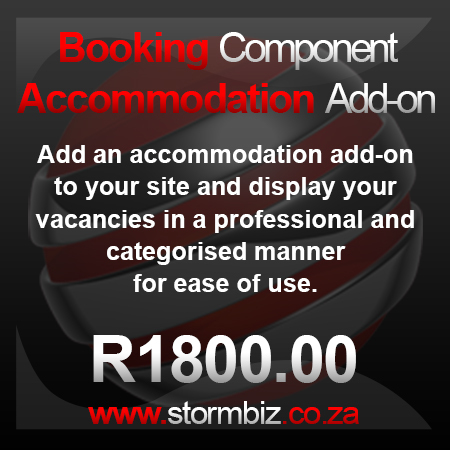 Booking Form - Let your clients book online, and you will receive an email from the website confirming a booking. Includes Contact Us, Services, Terms & Conditions, Testimonials and About Us Pages. Please remember that this is not a total website solution, this is an add-on to one of our website design packages, or can be added to your existing joomla website, and as such cannot be purchased unless you already have an up to date joomla website.